INDIANAPOLIS -- Two Indianapolis Public School officials have resigned over the continued fallout of the Shana Taylor sexual abuse case from February. Dr. Lewis Ferebee sent letters to Lela Hester and Shalon Dabney on May 31 saying he was recommending their termination. Ferebee received letters from both women that same day saying they were resigning effective June 30. They had the right under the law and IPS policy to contest the termination recommendation, but chose not to exercise those rights. Two other employees, William Jensen and Deb Lester, also received letters recommending their termination from Dr. Ferebee. They are contesting those recommendations. The IPS Board anticipates taking final action on all four at its meeting Thursday night. 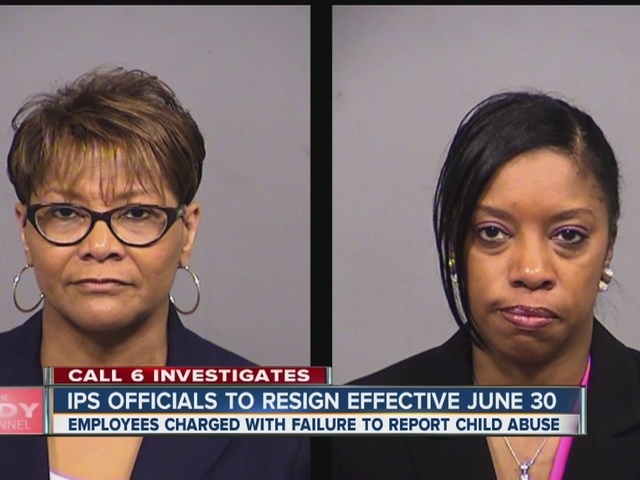 Hester and Dabney worked in the Human Resources Services Division and were charged with failure to report in connection with sexual abuse allegations against Taylor, a former IPS counselor. If Hester and Dabney complete a diversion program, as they agreed to in May , the charges against them will be dropped. Taylor was arrested on four charges of child seduction on Feb. 25. Hester's title was "human resource services operations officer, while Dabney's title was "employee relations coordinator." State law requires schools to immediately report abuse or neglect allegations to law enforcement or the Indiana Department of Child Services. School officials were made aware six days before they reported the abuse allegations to the Indianapolis Metropolitan Police Department. On May 31, 2016 Superintendent Dr. Lewis Ferebee sent letters to Mr. William Jensen, Ms. Shalon Dabney and Dr. Lela Hester informing them he was recommending the termination of their employment. On that same date, Dr. Ferebee received resignation letters from Ms. Dabney and Dr. Hester; both letters state they are resigning effective June 30. On June 1, 2016, Dr. Ferebee sent a letter to Ms. Deb Leser informing her that he was recommending the termination of her employment. All four employees had rights under the law and IPS policy to contest the recommendation of termination. Ms. Dabney and Dr. Hester chose not to exercise those rights and resigned. Mr. Jensen and Ms. Leser chose to contest the recommendations. The IPS Board anticipates taking final action as to all four at it Action Session this Thursday night.